EBLIDA recognises that your privacy is important to you and is committed to protecting it. EBLIDA does not collect more information about its Members than needed - just enough to enable us to carry out our work - and will not retain it for longer than is necessary. Information will be requested from you when you decide to subscribe & receive our email newsletter or decide to subscribe to our General mailing lists: EBLIDA-List. We are keeping the minimum amount of personal data about our subscribers, just enough to enable us to carry out our work. The only information we hold for our subscribers is the email address (mandatory), and the name (optional). EBLIDA do not collect more information than needed and will not retain it for longer than is necessary. When you subscribe to email newsletter, your email address will be added to the mailing list, which ensures that you receive once a Month a newsletter by email from us. When you subscribe to a EBLIDA-List, you will receive news, updates, information relevant to the European library sector. 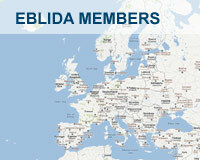 The mailing lists are for non-commercial use only and EBLIDA does not collect, share and sell email addresses. List Members can unsubscribe at any time. This website and the information presented on it, are provided by EBLIDA, its Members and by those interested in EBLIDA’s mission to promote and defend the interests of the library, archive and information sectors and professionals working for European citizens. While every effort has been taken to ensure the accuracy of the information contained on this site and to update it regularly, inaccuracies may occur and we cannot accept responsibility for them. Some areas of our site may provide links to other external sites that we do not own or control. We make every effort to ensure that links are kept up-to-date, but we are not responsible for the availability and for the changes of the content of those websites. This policy was last updated 16th May 2018.